AirAsia X celebrates their 10th anniversary with a special event marking the occasion at their very first destination, Gold Coast. The event was a good opportunity to share future plans, announce a contest and offer some special fares. Senior executives of AirAsia X welcomed a special commemoration liveried aircraft at the Gold Coast International Airport. The airline expects to take delivery of the first of sixty-six A330neo on firm order to be delivered during 2018. The aircraft will be delivered in stages until 2027. Together with AirAsia Group, the airline groups have close to 500 aircraft on firm order with Airbus. This confirms the airline groups’ position as one of the largest Airbus operators in the world. To commemorate this ‘Xciting milestone’, the airline is running a special AirAsia X Anniversary Scavenger Hunt online contest. Use the social media hashtags #10xcitingyears on social media platforms including Instagram, Twitter and Weibo. Between 2nd to 5th November 2017. Win 100 flights to selected destinations if you’re one of 5 winners selected. Full contest details available at 10xcitingyears.airasia.com. All-in, one-way fares start at MYR 250 for standard seats and MYR 750 for a Premium Flatbed. The promo fares are available on airasia.com until 29th October 2017 for travel between 1st May and 21st November 2018. 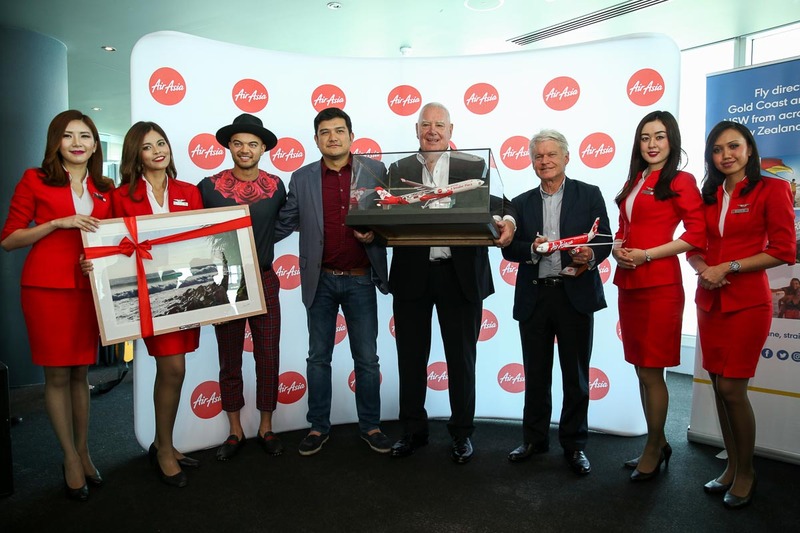 AirAsia Australia Ambassador Guy Sebastian; CEO of AirAsia X Benyamin Ismail; Executive General Manager Business Development and Marketing Queensland Airports Limited & Director of Tourism Events Queensland Paul Donovan along with CEO of Gold Coast Tourism Martin Winter, flanked by cabin crew.